One of the West Side’s least well known but most important stories is the history of the former Read’s Drug Store at Howard and Lexington Streets and its landmark role in Baltimore’s civil rights movement. Built in 1934 by Baltimore architects Smith & May, the press heralded this Art Deco structure as a local landmark from its beginning– a modern flagship store for the Read’s chain, continuing their 50-year presence at the bustling heart of the downtown retail district. Like many downtown commercial establishments in the early 1950s, the Read’s chain maintained a strict policy of racial segregation at their lunch counters. In 1955, a group of Morgan State students came together with the leadership of the recently organized Baltimore Committee on Racial Equality to organize a sit-in protest at the lunch counter of the Read’s Drug Store at Howard and Lexington Streets. They succeeded in this effort, marking this building as a witness to the first successful student-led sit-in protest in Baltimore and defining a powerful model for the more famous lunch-counter sit-in of Greensboro, North Carolina in 1960. 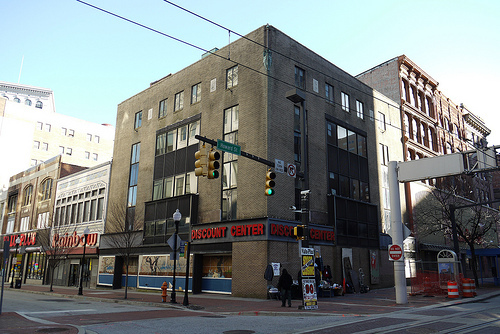 This building is currently threatened with total demolition by the proposed development of the Superblock by the Baltimore Development Corporation and Lexington Square Partners. Baltimore Heritage, together with partners and supporters from across the city, is advocating for the city to reconsider this proposal and encourage the preservation and re-use of this essential landmark in Baltimore’s civil rights history. Back then as today, location meant everything and this corner–described as “the heart of the retail shopping district”–was key. Over the next two decades, the store remained the flagship of the Read’s chain as their business grew across Downtown Baltimore and the region. 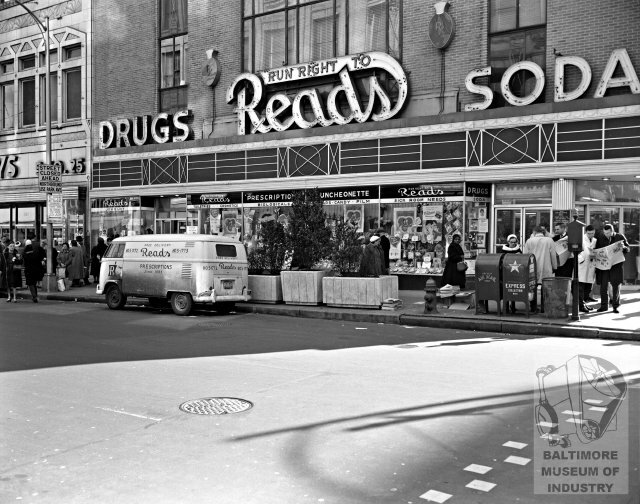 By the early 1950s, discontent with the widespread policies of racial segregation and discrimination at Baltimore restaurants and shopping establishments began to peak, especially among the community of students and faculty at then Morgan State College who could not receive service at the Read’s Drug Store located in the nearby Northwood Shopping Center. These Morgan students joined forces with a group of white and black Baltimore civil rights activists who organized a local chapter of the Committee on Racial Equality (CORE). First established in Chicago in 1942, CORE grew rapidly during the 1940s and 1950s, reaching over 60 local chapters by 1961. The organization of the Baltimore chapter began in 1952, with the efforts of Ben Everinghim, a history teacher at Edmondson High School, Herbert Kelman, a psychologist at the Phipps Psychiatric Clinic, attorney Robert Watts, former music teacher and founder of the interracial Fellowship House Ada Jenkins, Dr. Earl Jackson, a professor at Morgan College and the head of Morgan’s branch of the NAACP and others. After successful campaigns to desegregate the Kresge’s and Grant’s chains, CORE and Morgan students decided to combine efforts to desegregate the Read’s chain. Read’s official: Please call your students off. They’re staging a showdown here in our Northwood store. We’re losing business. Dean Grant: We teach our students here they must practice democracy and help others to understand it. I don’t think you want us to tell them what they’re doing is wrong. RO: Yes, but we’re losing business with them sitting at our counters. DG: Well, there are several things you can do. DG: Why not put a sign up in your store saying dogs, cats and colored people are not allowed? RO: Well, we couldn’t do that. DG: Well, why not put an ad in the AFRO saying that Read’s wants colored people to shop there but they can’t eat there; and you know you have another alternative, you can say to all your customers everyone can be served at our lunch counters. RO: Well, we are in sympathy with this thing – we’ll see what can be done. This building is a witness to an incredible event in Baltimore’s civil rights history and should be preserved as a continuing part of a vital neighborhood on the Downtown’s West Side. Please share your own knowledge and recollections of the civil rights heritage that can be found in the histories of West Side buildings and places. If the building was so important, those interested in its preservation should have raised funds to ensure its preservation. It’s a little late in the game to try to hold up sorely needed development of that area because of a dilapadated structure no one seems to care about. A modified design incorporating the historic significance of Read’s Drugstore enhances the development’s value to the community. Shame on the developers for not understanding the power of the Read’s opportunity. “Modified design” sounds nice, in theory — save the facade and all that. In practice, it’s extraordinarily complex and expensive, particularly for a building as tall as Read’s. The risk of collapse is always there. I have no connection at all to the developers or anyone associated with them, but what they’re seeking is reasonable: a glass-filled, wide open, functional, signature structure on a very important corner. Read’s history can be encapsulated on a plaque or in an exhibit at the Lewis Museum. In fact, an excellent civil rights exhibit, complete with an entire White Tower restaurant (from Howard and Centre) that also had a sit-in protest and a wall-sized mural of a protest on Howard Street already exists — in the City Life Museums. Which closed in 1997. Without a peep from the NAACP. Pingback: Join us for a second West Side Walking Tour on January 20! What makes Baltimore a great place for tourists is it’s real history – in it’s buildings and locations the history of our country comes alive. Just today I found Douglas’s row – a row of townhouses built by Frederick Douglas – what a crime if it had been torn down for a shiny hotel – we must think ahead about what places are worth saving for the future. Ironic to see this article. 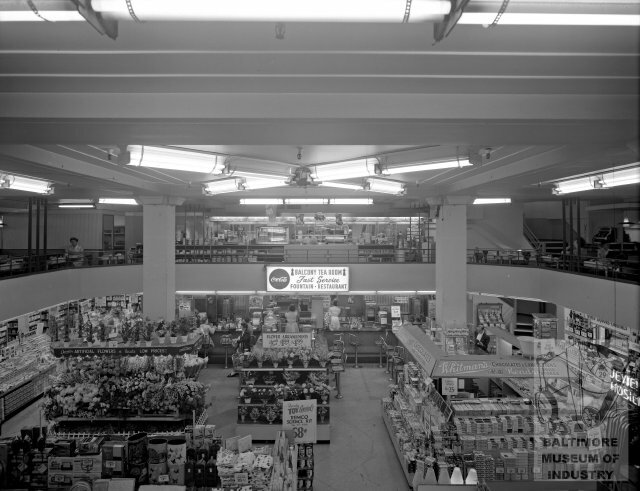 My mother worked, as a cashier, at the delicatessen of the 1938 vintage Kresge five-and-dime Department Store. It was located at the Southeast corner of Park and Lexington Streets, opposite Gutman’s in downtown Baltimore, MD. In 1955, I remember my Aunt taking me to Mom’s job and being scolded for sitting at the counter. I just wanted a soda float, which was a dip of vanila ice cream in a glass of coca cola. Who knew this little ‘colored’ girl, all of 5 years old, was in breech of a major store polocy. “Negros can work for and purchase store goods; however, they can not sit and be served in the store”. My Mother, in a frantic at my disappearance, explained this to me, as she lifted me by the arm off that round red leather seat on chrome legs. I never forgot that day. It was my introduction to racism. Regretfully, the picture that shows the interior of the Read’s store is not the location at Howard and Lexington Streets. The acreage would not have allowed the space shown in a shopping mall. I wonder what plans those who wish the Read’s builidng considered a historic building have to establish some viable landmark that will be supported by non-government funds. Thanks for your comment! We’re confident that the interior photo is the Read’s Drug Store at Howard & Lexington Streets thanks to the big balcony (a modern feature for the flagship store) and the catalog record from the Baltimore Museum of Industry collection. Add insult to injury, it’s already been renovated or changed from its original state. It makes the preservationists’ argument somewhat…moot. I have fallen in love with Baltimore – more specifically, its history – but if we attempt to preserve every single detail and/or every single place our forefathers journeyed, we would be nothing but another historic Williamsburg, VA. I am Black and I get sooooo excited to see an hear about the history of Baltimore but we have to move forward or get left behind…seriouly left behind.